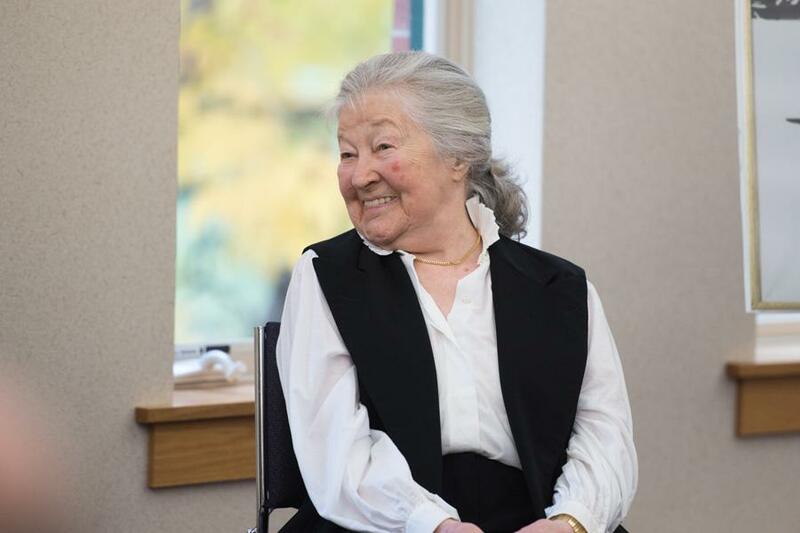 Author and Holocaust survivor Ava Kadishson Schieber speaks at Fiedler Hillel about her new book, “Present Past.” Schieber launched the collection of stories, artwork and poetry that describe her life after the Holocaust at an event Sunday. Author and artist Ava Kadishson Schieber’s first painting after surviving the Holocaust was of a whirlpool. Schieber launched her book, “Present Past” — a collection of stories, artwork and poetry that describe her life after the Holocaust — on Sunday at Fiedler Hillel. The event was attended by roughly 40 people, who received signed copies of Schieber’s book. Published by Northwestern University Press, “Present Past” follows Schieber’s first book “Soundless Roar,” which was published in 2002 and is written in a similar format. “Soundless Roar” focused on her experience during the Holocaust, when she was forced into hiding on isolated farmland for four years. Painting was Schieber’s first step in opening up about her experience during and after the war. Schieber started writing about her Holocaust experience for her grandchildren. She said she wanted their generation to understand the history and its potential to repeat itself. The book launch event was conducted in an interview format, split into three sections by readings of excerpts from the book. Weinberg senior Molly Benedict was one of the three students from Jewish studies Prof. Phyllis Lassner’s “Gender, Race and the Holocaust” course who read an excerpt. Benedict said it was eye-opening to learn about life after the Holocaust, considering most Holocaust accounts describe experiences during the war. She also said the format of the event was a good representation of the way Schieber’s book moves back and forth between past and present. SESP senior Jenny Hendrix joined SESP Prof. Danny M. Cohen in interviewing Schieber. Hendrix said she met Schieber last year when Schieber was a guest speaker in Cohen’s class. Hendrix told The Daily that Schieber is “one of the most amazing people” she’s had the opportunity to speak with. During the event, Hendrix asked Schieber about the current conflicts happening around the world, including the Syrian refugee crisis. Schieber said the Syrian refugee experience, which forces people to leave everything behind and take only what means the most to them, reminds her of her own experiences.